1. Remove the woody part of the asparagus by snapping the ends off (they should break off naturally). 2. Coat the bottom of a frying pan with the oil then add the asparagus and cover with a lid. Place the pan over a low-medium heat for approximately 5 minutes or until the asparagus spears are al dente. 3. Remove the pan from the heat and drain the asparagus on kitchen paper. Season with salt and freshly ground black pepper. 4. Cut each slice of smoked salmon in half lengthways and roll a piece of salmon round each asparagus spear. 5. Place the eggs in a large pan of cold water (the water should cover the eggs by 2cm). Place the pan over a high heat and bring the water to the boil. As soon as the water starts to simmer, set your timer for 2 minutes. 6. After 2 minutes, remove the eggs from the pan and place them in egg cups. Crack the top of each egg with a spoon and remove the top. 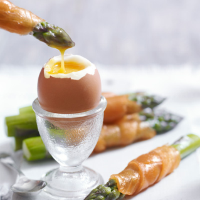 Serve with the smoked salmon and asparagus soldiers. Spread the smoked salmon with a thin layer of Heston from Waitrose horseradish sauce before wrapping it round the asparagus spears.